Thanks to everyone who commented about my new blog look! I'm so glad everyone likes it! For those of you who were wondering where the fishing rod is, you can go to the About Me tab and you'll find at least one fish! I gave Mr. Squash a number range and he picked two winners. Cindy of Sew Cindy and Sue of Cozy Little Quilts are the winners. Congratulations ladies! I thought I would make us some goodies for the weekend. While working out on the treadmill the other day I was watching the Food Network. I saw the Neely's make these Banana Cupcakes and had to give them a try. 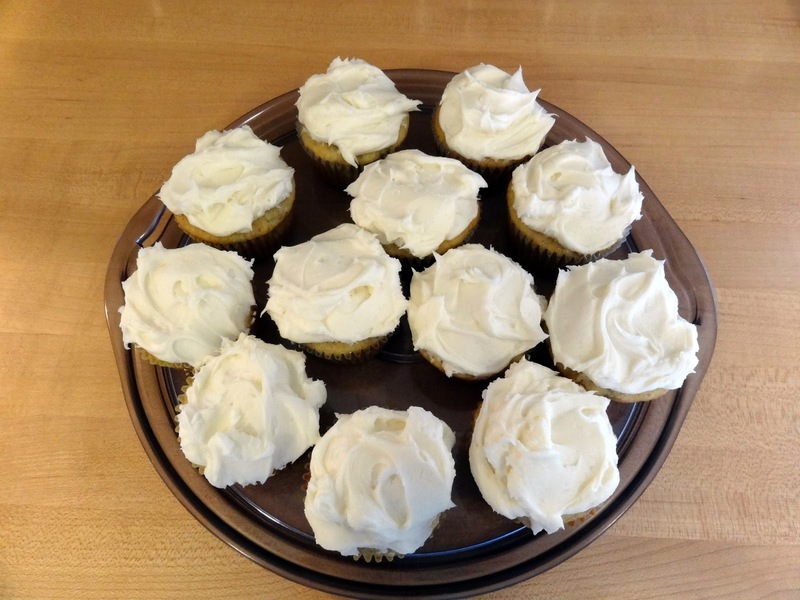 Instead of a molasses cream cheese frosting I just made a regular cream cheese frosting - Mr. Squash's favorite. I'm warning you, if you made them you'd better at least double the recipe because they will go fast! Back in March of last year I showed you my new fat quarter cupboard here. I can't believe it's been a year since I got it. Would you believe it's now full to overflowing? Sad, but true. We liked the work on it so much we purchased another item from them which was delivered the other day. Say hello to my new coffee table. It doubles as a blanket chest which we needed badly. It's made of pine with an oak stain which will darken with age. We'll be getting a few more pieces from these folks in the near future. Just had to check the recipe. I seem to always have over-ripe bananas on hand. I have been baking banana bread in my bread machine lately. YUM! I think I will give these cupcakes a try. Both look yummy! I love chests for storage and that homey look that has developed over time. Congrats to the lucky winners! Congrats to the winners. It's breakfast and I'm steeping my tea. Salivating over those cupcakes! A very beautiful blanket chest. I love your new blanket chest ! Your cupcakes look yummy...and I am so hungry for a treat! I think the blanket chest is wonderful...perhaps another good hiding place for fabric? Lovely blanket chest! I'm sure you'll enjoy it! Wow! The cupcakes sure do look yummy :-) Congratulations to the winners!! I clicked on over to the FQ cupboard and see that's it's so pretty. It probably is overflowing, LOL, with lots of goodies. 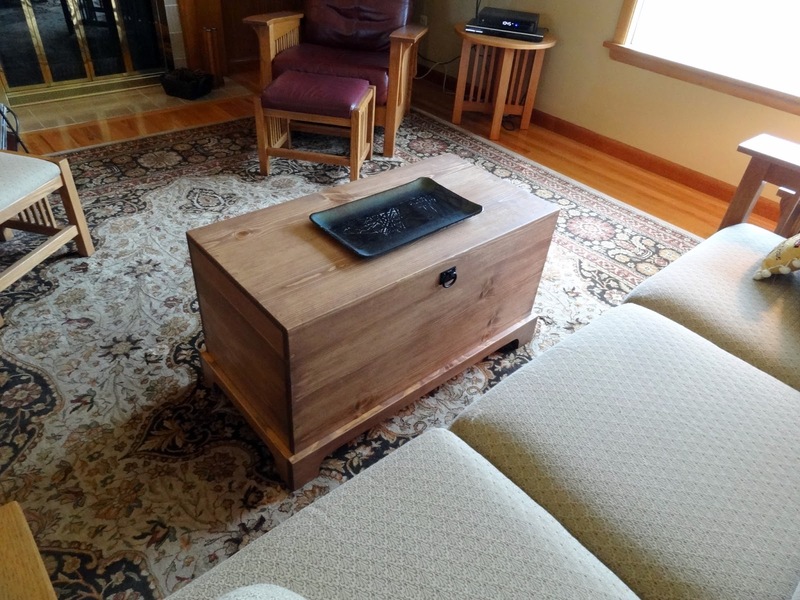 And how long before your new beautiful coffee table will be filled with beautiful homemade quilts to warm you and Mr. Squash? Love the blog makeover! And your new chest looks like the perfect thing for storing quilts. oh lord those cupcakes look devine. the storage chest is so cool, did you get that locally?? Hugs!! I love your new look! and your new chest. Wow! Just saw your "new look" and LOVIN' it! It's so friendly and pretty. Great job! In Seattle this week so I missed WW sunshine!! Congrats to the winners. The box coffee table is beautiful. We have a box sort too (full of books ATM). Your new looks is so full of Spring. Thanks for the recipes. Congrats to the winners! I agree with Mr Squash about cream cheese frosting. Yummy!